If you are looking for information on the Bath Royale Premium Round Toilet Seat with Cover you are in the right place. We are going to give you a full overview of this heavy-duty toilet seat and explain what the features are. I will also tell you what the customer opinion is, where to get the best deals and discounts and most important whether or not it does a decent job. I’ll also point you in the right direction where we would recommend purchasing from so you get your new bariatric toilet seat that you will love and that will do the job. Before we get right in the depth of this review of the Bath Royale Premium Round Toilet Seat with Cover, maybe you don’t want to read a full review? You may just want to buy this heavy-duty toilet seat by premium round toilet seat by bath royale. If that’s the case you can click on the link below to go straight through to Amazon right now. 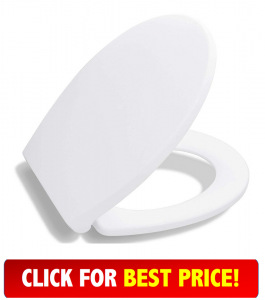 Maybe you would like to check out our top choice Big John toilet seat? 1.8 Who Is the Bath Royale Premium Round Toilet Seat with Cover for? 1.9 Where to buy the Bath Royale Premium Round Toilet Seat with Cover and how much? Ok straight up the biggest mistake that I see from customers who buy a new toilet seat is not measuring what they have now and getting the wrong style. Yer the odds are good at 50-50 but you get it wrong and then you have to pack it up, return back and hope they have the other in stock, blah blah. It’s easy to measure so please just do it. I have included an image below to determine if you need round or elongated. Bath royale toilet seats fit all brands of toilets. These include Kohler, American Standard, Toto, Crane, Eljer, Caroma, etc. They also fit toilets with non-standard mounting hole spacings 4-7 inches. Just a NOTE: NOT compatible with bidets that install between seat and bowl. There goes that dreaded sound of the toilet seat and lid slamming on to the porcelain. NO more kids getting fingers jammed, pinched or squashed from the slamming seat. 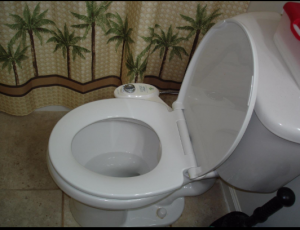 Another thing is with the soft close it prevents cracking the toilet especially if you have one of those big heavy seats that weight a ton☺. The quick release system on the Bath Royale Premium Round Toilet Seat with Cover helps you remove the seat easy for cleaning. You know how hard it is to do a complete clean on standard seats where can’t gain access around the mounting area guys seemed to get urine at times, grime, and odor-causing germs collect. Help keep your bathroom smelling fresh and clean. BETTER, MORE SANITARY and LONGER-LASTING than painted wood, molded wood or vinyl-covered foam padded “soft” seats. Made of top quality, 100% pure (not recycled) polypropylene (plastic) which is non-absorbent, chemical, and stain-resistant. All Bath Royale seats are a solid color throughout, will not chip peel or fade. The beautiful HIGH-GLOSS finish will last for years with proper care and cleaning. 2-YEAR WARRANTY is double most other brands. These seats are stronger than most other brands, but in saying that being pretty comfortable too. Softer and warmer to touch than painted wood, acrylic or other plastics because pure polypropylene is a thermal insulator (like coating on an electrical wire) and does not conduct heat. Tested to 400 pounds, 4 non-slip bumpers evenly distribute weight. The seat and cover will flex but guaranteed not to crack, break or permanently deform. All parts* and step-by-step instructions are included with your seat. The only tool you will need is a Phillips head screwdriver. Attach seat to mounting bases. Adjust seat’s position on the bowl for a perfect fit, then tighten screws. Mounting bases must be rotated so the posts face the FRONT OF THE TOILET BOWL (not the tank). 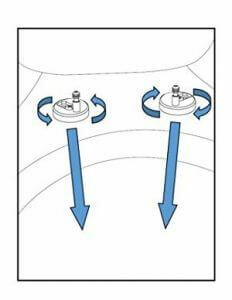 Otherwise, your seat will appear too short (see diagram at left). Slow-close DOES NOT WORK until the seat is installed on the toilet. * Some 1-piece toilets or bowls with a concealed trap way (aka flat sides or “skirted” bowl) require “top mount” hardware (sold separately). Let’s check out what those who have purchased are saying. The reviews on Amazon.com… for the Bath Royale Premium toilet seat is awesome. With over 3,000 reviews and a 4.7-star rating out of 5, you have to admit that’s good. I am very hard pressed to find bad reviews of the seat. The main views that are 1 or 2 star are it didn’t fit there toilet, comes loose or hard to clean. I guess with over 2800 positive reviews I say it’s a great choice. Who Is the Bath Royale Premium Round Toilet Seat with Cover for? If you are looking for a strong sturdy toilet seat that provides comfort, nice looking seat then you need to take a look at the Bath Royale Premium Round Toilet Seat. 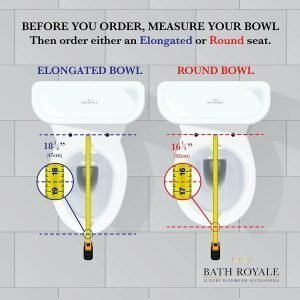 Where to buy the Bath Royale Premium Round Toilet Seat with Cover and how much? Not only are they a well-trusted site, but you also get fast shipping straight to your door and always at the best prices. In fact, at the time of writing this review, Amazon.com had a special offer of Free Shipping on all products. Well, that finishes off this review. Overall I’m pretty impressed with the customer feedback and the reviews that have been left on Amazon.com. I hope it has answered some questions you had about the Bath Royale Premium Round Toilet Seat with Cover.